Recently I was listening to a podcast titled “The Chubby Kid Mentality,” on iTunes. The guest speaker was mentioning as a child she had a bigger physical disposition than the rest of her tall and slender family members. She knew she was different. Because she was bigger, she found herself complaining to her dad one night. He wisely gave her this advice, “If it bothers you then it’s time to do something about it. 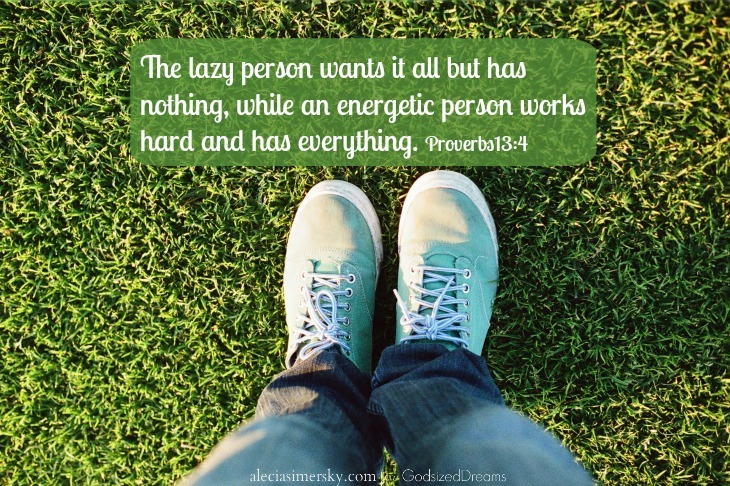 ‘The lazy person wants it all but has nothing, while an energetic person works hard and has everything.’ "
Too often I can relate to the lazy person who wants it all but doesn’t want to work hard to make it happen (<====Click to Tweet). I want to sit back and pray, but do nothing on my part. Less than 20% of Americans attend church (according to one poll). Even if you disagree with this statistic you can't argue with the fact that all of the churches across America are declining in attendance. I'm sure the reasons differ for people leaving, but this is where Rachel Held Evans' new book Searching for Sunday comes in. 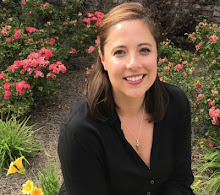 It's not an anecdote as to why, but, a personal journey of her own loving, leaving, and finding the church (just as the subtitle says). Aren't we all looking for Sunday? Searching for Sunday has been more than a book for me, it's been a confirmation of the tension I have felt within the church the last few years. 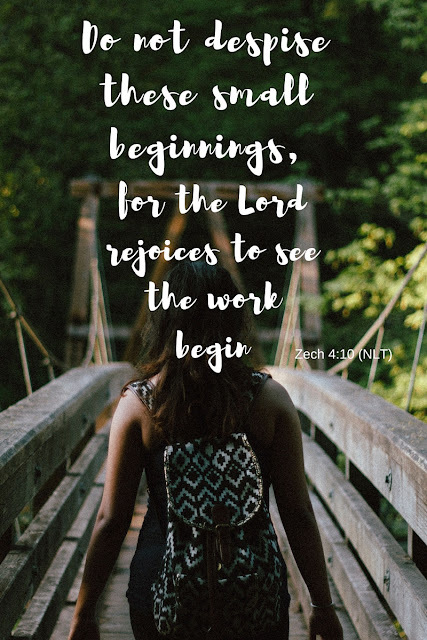 Like Rachel, I have been searching for authenticity and a community of believers that desires to be grace-filled, trustworthy, and real. This isn't an easy task. But I want to be a part of the church community, so I keep looking. The journey back to the church is embracing the messiness of community and the power of grace. Ah, yes, after reading the introduction I had a very good feeling I was going to enjoy this book. Can love really change our communities? Our churches? Jesus seemed to think so. I cringe when I hear stories of people not going back to church because of unfriendliness, judgemental looks and/or comments. If only we could see how this hurts those searching for more, searching for God, would we do better? 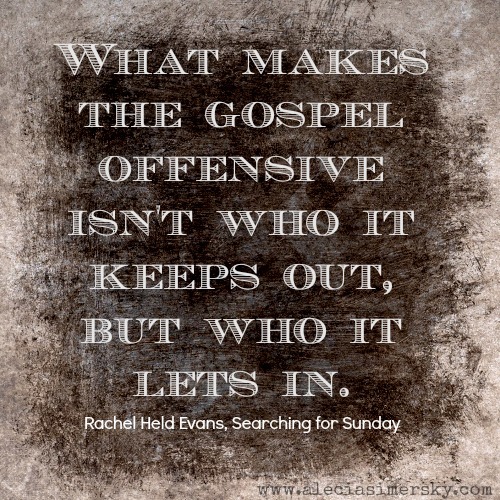 Rachel does a wonderful job of laying out what causes people to leave the church and then what will bring them back: love, grace, scripture. They need to feel close to God, the people in church need to be honest with themselves and others about their sin and put down their masks. 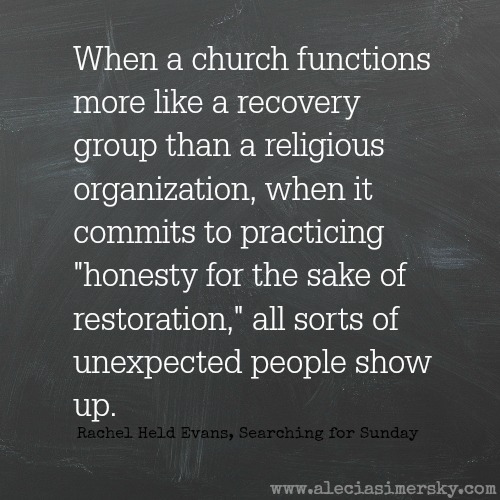 We need church to be a congregation where hurting, seeking, broken people are ushered in and asked, how we can help? How can we pray? How can we meet you right where you are? I like when she compares church to how an AA meeting is run, and I can't help but agree. She goes onto ask why our churches feel more like "country clubs than AA?" We forget church is for the sick. At our core we want a church that cares that we still struggle, that knows we aren't perfect but loves us anyways, that is happy we show up- baggage and all. There is so much more I wanted to add to this, but it was already getting lengthy for a blog post. 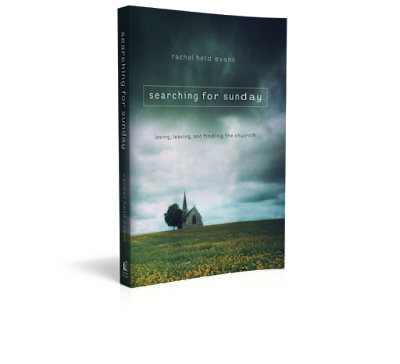 If you are on a spiritual journey and trying to find your way back to God, to church, please go find a copy of Rachel Held Evans book, Searching for Sunday.